While going through my ghettoVCB backlog this past weekend, I came across an issue reported by a user with snapshot removal using vim-cmd in ghettoVCB. 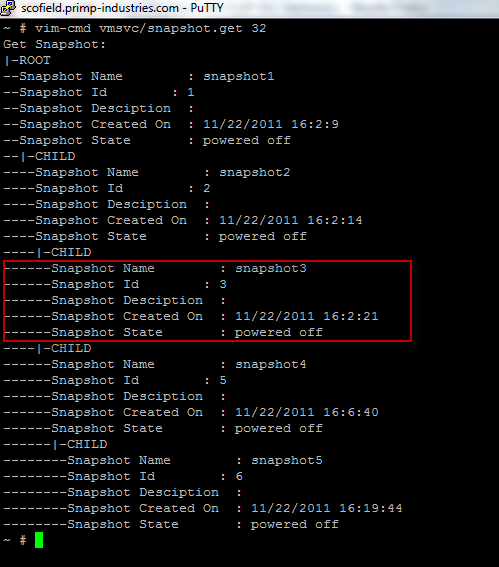 It looks like with the recent release of ESX(i) 4.1 Update 2, the "snapshot.remove" required parameters have changed. Prior to 4.1 Update 2, the command would just require a virtual machine's vmid and if it only had a single snapshot, it would automatically consolidate the snapshot. If a VM had more than one snapshot, users would then need to specify some additional parameters that identified the particular level of the snapshot tree and the snapshot index to be removed. This was pretty difficult to use, even for myself. It now looks like VMware has simplified this command and introduced a new required parameter called snapshotId in ESX(i) 4.1 Update 2. As you can see from the screenshot, there is a new property called "Snapshot Id" which can now be passed into the snapshot.remove operation. This now makes snapshot manipulation using vim-cmd extremely easy to use. There is a fix in ghettoVCB.next that will support the new snapshot.remove operation which hopefully I'll be able to release very soon. http://www.vmware.com/patchmgr/download.portal, which esxi version you used? Would you like to share me?